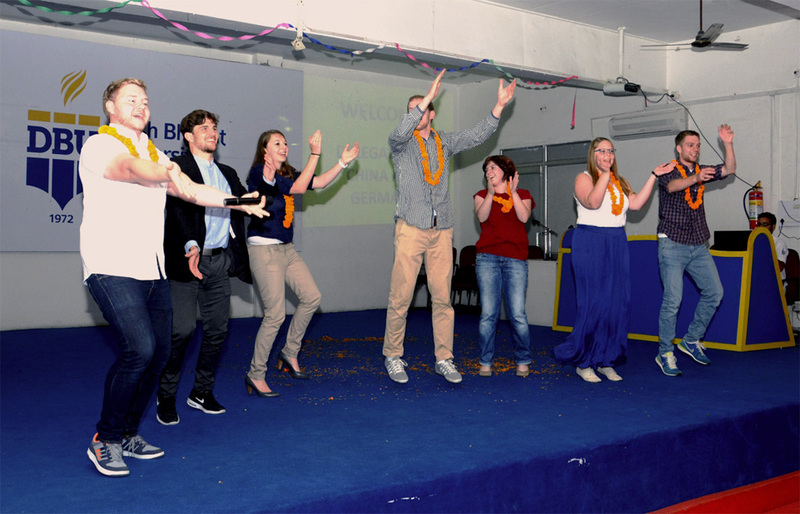 Two delegations consisting of university and college students from China and Germany visited Desh Bhagat University in the best university in Punjab and participated in the International Youth Cultural Exchange Programme at the university. The coordinator of these delegations was Ms. Bawra Shergill, a member of Friends of China. Chinese delegation was led by Mr. Xiong Liang and German delegation was headed by Mr. Marcel Scharf. The objective of the programme was to enhance proximity between India, China and Germany, through educational and cultural collaboration. While welcoming the delegates, Pro Chancellor of Desh Bhagat University Ms. Tajinder Kaur said that a large number of students from different countries are pursuing studies in the University. She said that such cultural and leadership exchange programmes dismantled the barriers between different nations as the youth all over the world face same challenges, share same responsibilities and nurture same aspirations. Desh Bhagat University Chancellor, Dr. Zora Singh welcomed the delegates and expressed the hope that their visit to India in general and to Desh Bhagat University in particular will prove quite fruitful and they will return to their country with lot of knowledge, exposure and sweet memories. While speaking on the occasion Vice- Chancellor Dr. Virinder Singh said that DBU has the educational facilities of international standard and students coming from abroad are provided homely environment to enable them pursue their courses in the best possible way. Faculty and students of Desh Bhagat University interacted with the delegates on different topics like leadership, management, higher education and cultural matters. The delegates expressed pleasure and satisfaction over the visit saying that it has added to their knowledge and experience. They also took round of the campus of the university and apart from the other departments; they evinced keen interest in Hotel Mangement and Airlines Department. A cultural event was organised for the delegates in whom the host university students presented Gujrati, Punjabi and Himachali folk songs and a colourful cultural programme. The Chinese and German students also exhibited their talent by participating in different events and through their folk dances and songs.